With core influences being legendary musicians such as Steve Cropper & Pete Drake and attributes of 60s European pop and swinging jazz entering into the mix, music lovers everywhere will dig the resulting collaboration of Fetzer and Cullum’s unique yet classic styles. Introducing… Steelism! 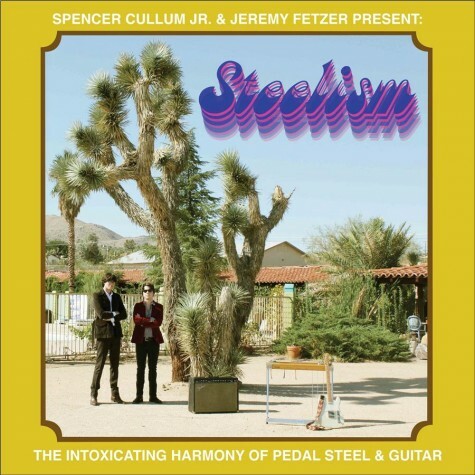 “Steelism” is a pedal steel+guitar led collaborative project between Spencer Cullum Jr. and Jeremy Fetzer, both from Caitlin Rose band. Their debut two-track EP was recorded with engineer Mike Odmark, and fabulous crew of Nashville musicians: Jon Radford (drums), Mike Rinne (upright bass), Andrew Combs (acoustic guitar) & Matt Rowland (keys). Available now on their bandcamp. A student of pedal steel artist BJ Cole, Spencer Cullum Jr. has been playing pedal steel guitar across the U.K and U.S, and he is also known as a member of the Deadstring Brothers from Detroit, Michigan. Jeremy Fetzer is also known as the lead guitarist of Nashville’s foursome, The Deep Vibration (named from Lou Reed). Their 2008′s five-track EP “Veracruz” was produced by former Neil Young producer Niko Bolas and recorded with guests including Spooner Oldham, pedal steel veteran Al Perkins and Gillian Welch. Stream their first full-length “Strange Love,” digital album (released 01 February 2011), available on their bandcamp, iTunes.